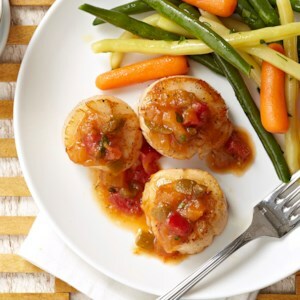 Find healthy, delicious scallop recipes including baked, grilled and sautéed scallops. Healthier recipes, from the food and nutrition experts at EatingWell. 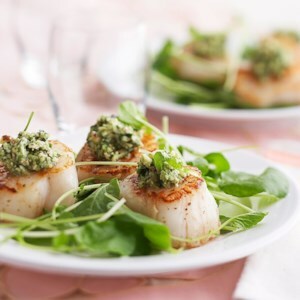 When it comes to mouthwatering, impressive dinners ready in minutesnothing beats scallops, with their crispy, golden brown crust and succulent, buttery interiors. Here are easy recipes for pasta, salads, kabobs & even tacosall ready in under 30 minutes or less. 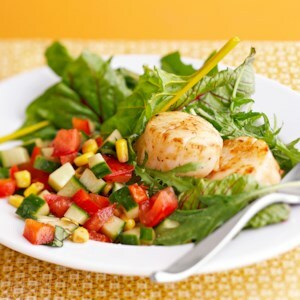 A nice option for a light lunch, these seared scallops are served with a fresh tomato, cucumber, and corn salad, and drizzled with a tasty basil vinaigrette. 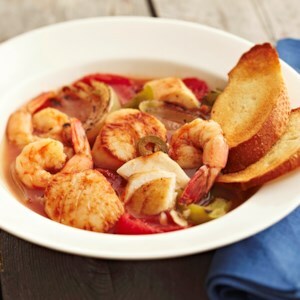 This stew is all about the fish--shrimp, scallops, and halibut chunks fight for space on your spoon. The baguette slices are key--you'll want to use them for sopping up the tasty tomato-based broth. 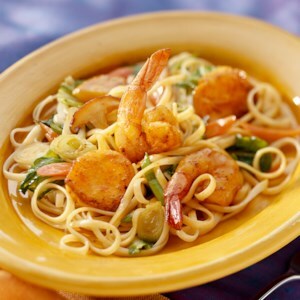 Apricot nectar adds a touch of sweetness to the soy- and ginger-based sauce flavoring this 25-minute seafood linguine recipe. The shrimp and scallops are coated with a curry mixture which adds taste and color to this delicious dish. 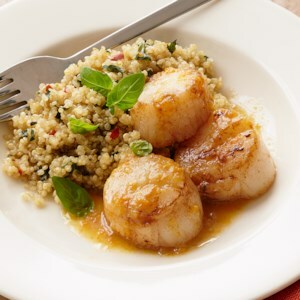 A quick and impressive dinner, scallops turn succulent and tender in the air fryer. The lemon-herb sauce is the perfect way to bring zest to each bite. Be sure to cook the scallops to temperature. They may not brown in the fryer, so don't wait for a golden crust to tell you they're ready. 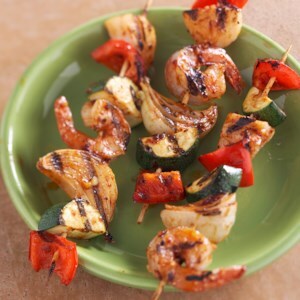 Perfect for a cookout or picnic, these Southwestern-inspired kebabs are a fun, healthy, and flavorful way to grill seafood and vegetables. 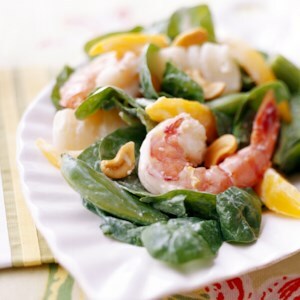 A velvety dressing accented with ginger and orange brings out the best in tender scallops, succulent shrimp, and juicy mango in this sophisticated spinach salad. 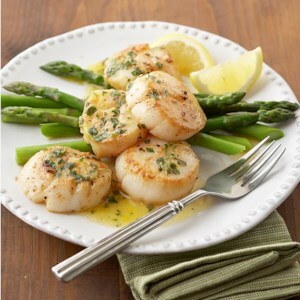 In this 15-minute recipe, crisp and tender asparagus spears serve as a vibrant base for lemon- and tarragon-flavored sea scallops. This 20-minute recipe comes together quickly with the help of frozen vegetables and store-bought salsa. As long as you've got frozen scallops in your freezer, this main dish recipe can be on the table in just 35 minutes, using other common ingredients you'd normally have on hand. This pasta main dish is ready in just 40 minutes. 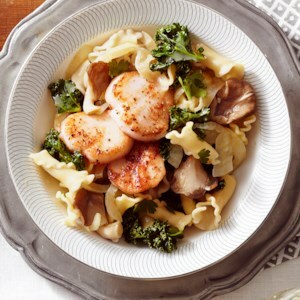 Large sea scallops take center stage, served atop ruffled-edge pasta with a lemony mushroom, fennel, and kale mixture. 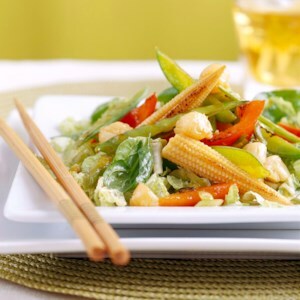 This 30-minute stir-fry salad offers an abundance of flavor and texture. Scallops and vegetables are stir-fried in a delicious orange-sesame-soy mixture and served on a bed of spinach and cabbage. 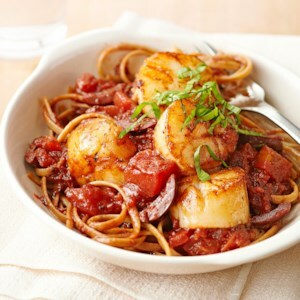 If your market doesn't offer bay scallops, you can substitute the larger sea scallops--just cut them in half crosswise before cooking. Get perfectly cooked scallops every time with this easy method. 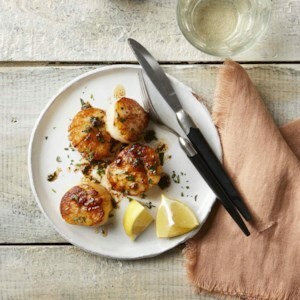 Sea scallops (the large ones) are sautéed in butter that turns deliciously nutty as it cooks, to make a super-fast, special dinner. A splash of lemon juice and fresh herbs finish the dish. Round out the menu with sautéed spinach and brown rice or orzo. 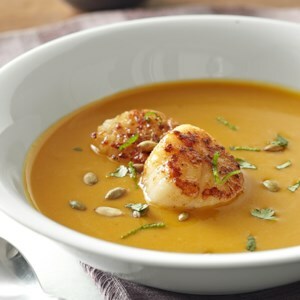 This butternut squash soup is silky and rich with the addition of coconut milk. Each serving is allowed a couple of seared scallops and is topped with pumpkin seeds, cilantro and lime peel for an added wow-factor. 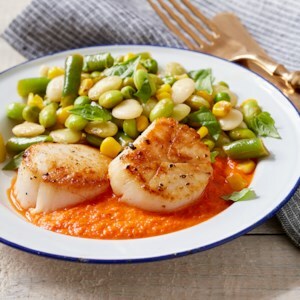 This classic American succotash dish has added interest when its topped with scallops. It's a delicious meal for any night of the week! 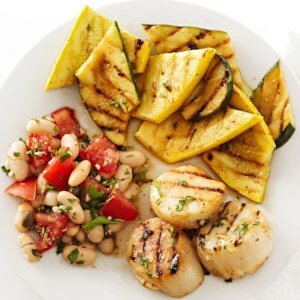 A simple honey-mustard dressing seasons both the squash and scallops in this quick-and-easy grilled recipe, ready in just 25 minutes. 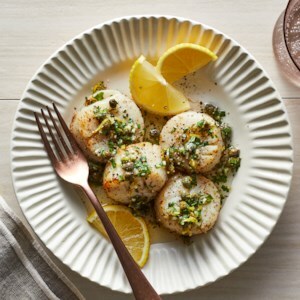 A refreshing mint, almond and Parmesan cheese topper is a tantalizing flavor partner for these plump, tender sea scallops. 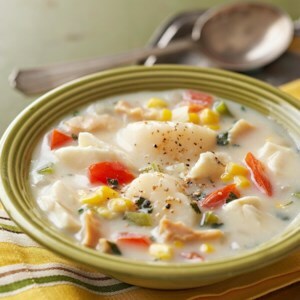 The addition of halibut, scallops and clams turns ordinary corn chowder into an extraordinary meal-in-a-bowl. 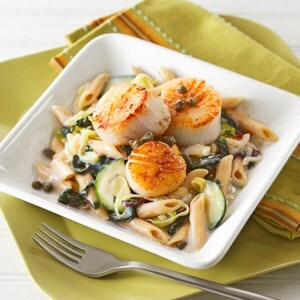 Crispy, seared scallops combine with whole-grain pasta and greens to make this flavorful complete meal. This Italian-inspired dish is full of flavor. Use whole grain or multigrain fettuccine to make it a healthier option. 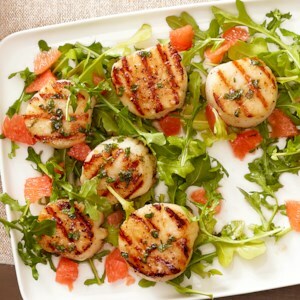 Rich-tasting scallops are even better when paired with the slightly bitter taste of grapefruit. Drizzled with honey and sprinkled with fresh mint and ginger, this salad feels fresh and flavorful in any season.